Just a question, could "hold" and "hush" be parameters or controllable by midi, it will be great to have the control of this without using the keyboard, we have to keep the window open, not easy in a live situation like concert for example, anyway Scale Walker is perfect with a launchpad. I'll check around and see if I can find my gumption; I seem to have misplaced it. Hoping that quest for gumption is making progress, Snowglobe - your suite is still appreciated! Came across a glitch/bug and was wondering if anyone could brainstorm a workaround. In theory, this should prove to be a "human arpeggiator" - allowing me to alternate two keys in real-time while getting a random arpeggiator effect. However, if two different-keyed inputs would result in the same note, it seems that the "note off" of the early input overrides the subsequent "note on" of the later input. For example, say I'm alternating between C4 and D4 on the physical keyboard, in a major scale, and the random sequence happens to go top to bottom (for ease of description). I'm not sure if there'd be any software fix (especially given those gumption issues! ) but maybe there's an alternate way of achieving the same effect that won't result in occasional hiccups? The same glitch exists in Random From Range, as well. When the Scalewalker window is maximized, the highlighted (darkened?) portion won't respond to click-and-drags. There's about two pixels on the far left of the probability % that will respond. Maybe there's some hidden element? Obviously the workaround for now is to add an extra "dummy" rule to allow the sideways scroll. My gumption is mostly taken up by my irl job these days. Haha, I know that feeling all too well! You're not forgotten. Trying to understand how to get music out of these things is very near the top of my list. Impossible to forget such an important piece for Buzz. It's like peer machines, PXP mod from chahur or polac vst. I hope to see more video and/or tutorials from you (or from a buzzer) because this tool is just a Giant Step for many reasons (live impro, help writing, experimenting and such...). I never make a bmx without ScaleWalker, its just impossible. My job is finished because I'm an old man now, I hope to be a full time buzzer ! 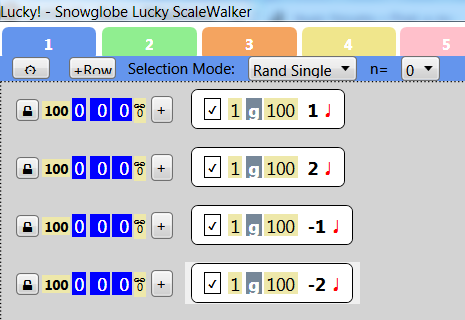 Seriously, your machines are awesome, many commercial things are just pathetic compared to ScaleWalker, I think we have to open a topic in the Presets and Templates place, ScaleWalker has his own preset format, it is so much versatile, best tools in Buzz. How do we get more old men into buzz? But don't wait too long, or the problem will eventually be back. I'm working with home care this summer so I'll see what I can do. -Have a look at this tracker while I fix your catheter. Ready to rok? Have a look at this tracker while I fix your catheter. Ready to rok?